Mata is a programming language that looks a lot like Java and C but adds direct support for matrix programming. Mata is a compiled language, which makes it fast. 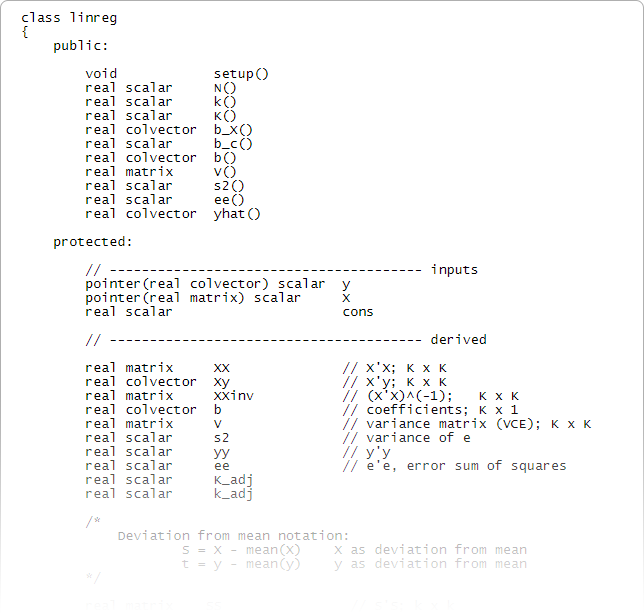 You can use Mata interactively when you want to quickly perform matrix calculations, or you can use Mata when you need to write complex programs. Mata has the structures, pointers, and classes that you expect in your programming language. In fact, Mata is Stata's development language. Most new features of Stata are written in Mata. This includes multilevel modeling, latent class analysis, Bayesian estimation, and even the core algorithms of the graphical SEM Builder. But Mata is not just for Stata developers; you too can take advantage of this powerful programming language. See all of Mata's features. You can use Mata interactively. Or you can write a simple program for regression. Or build a regression system using structures or classes. b is K x 1, coefficient include intercept if there is one. b_c() returns b_c:  1 x 1  containing b[K] or 0. Calculate inverse of S'S = SS(). This routine called only if cons, meaning K = k + 1. SS() is k x k -- it excludes constant. We want the full K x K inverse. There are many great resources for learning Mata. Programming an estimation command in Stata, a series of posts on the Stata Blog. Learn more about all of Mata's features.